Woooohooooo!!! I have finally finished my teeny tiny granny stripe blanket (when I should have actually been finishing this one - whoops). This blanket was started on our family holiday a few weeks ago, and nearly finished while watching the Royal Wedding last week (because everyone knows that the Royal family are totally into crochet... or was it Croquet?). Loving the grey and white stripes on this one. 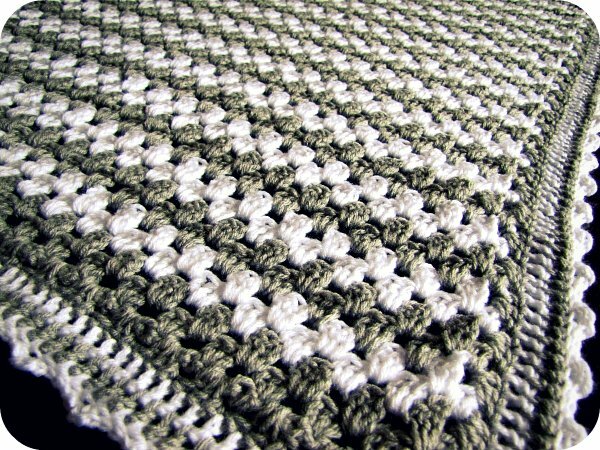 Once again, I used this pattern for my edging and love it. In keeping with tradition, the classic 'here's my finished blanket' pose. 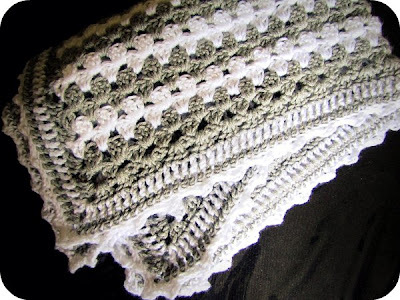 To check out my other finished granny crochet blankets, go here. This is really lovely - well done. Love the grey and white combo. I've used Lucy's pattern too before to make a ginormous rug for my son. Her instructions are just so easy to follow. Love it! Just finished a blanket myself that i had started ages ago. Beautiful!!!! Thank you for sharing the edging pattern. This blankie would be the perfect gift... I will add it to my "someday" project list! oooooooooh Kristy it's B-A-EUTIFUL! I LOVE IT! 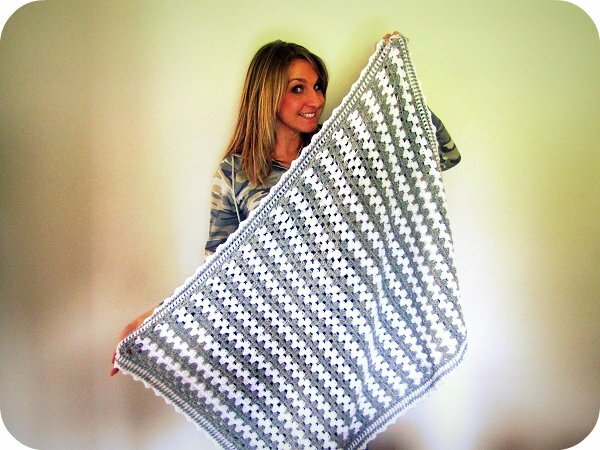 And how sweet to make a small blanket! Oh, that's a great one! I've also just finnished my first blanket. It is gorgeous. I love grey. Wow it is GORGEOUS! The colours are the best. Wonderful colors and pose! I'm sure the recipient will love it too!! I started a huge one block granny and stopped when the weather got too hot here. Probably won't work on it again until fall. Thanks for sharing! Looks great! I do like that grey/white thing the blanket has going. You finished it pretty quickly I think. I LOVE! I have been trying to learn to crochet for a few months now and seem to be doing not so well. I just get so confused and waste hours on the internet looking for 'how to crochet' and it still doesn't help. I love your funky style you bring to crochet and I want some too lol! Oh! you seriously make the best blankets!! I really like your colour scheme in this one, I wish i could finnish something! Ooh that is g o r g e o u s ! I don't think I have seen granny stripes before and I love them. Beautiful colours and edging. Love the grey and white stripes! Well done! I'm on to my fifth granny square... still feels like progress, better than the previous unravel, start again, unravel, start again pattern I was following. oooooh lovely. It looks really squissy and warm. Love the stripes! Ooo! I love the edging! Grey and white, always one of my fave combinations too. Wowie! Really really nice, I loooove the grey and white! Well don! Thanks for your comment, my blanket is slightly bigger, so it will take a while I'm afraid :-)!! The gray and white looks so soft and pretty! Beautiful job! I love it! I want some grey wool now!! Hope you've had a lovely week, enjoy the weekend. I love the colours you chose and the pattern. I'm still trying to decide what type of blanket to make but I want to get started before it gets too cold. Have a great week. very nice! love the grey and white! I love your baby blanket! It´s perfect and the colors are great!